Bring broth to a boil in medium saucepan. Reduce heat to low to keep broth hot. Meanwhile, heat oil in large saucepan over medium heat. Add onion; cook and stir 4 minutes. Increase heat to medium-high. 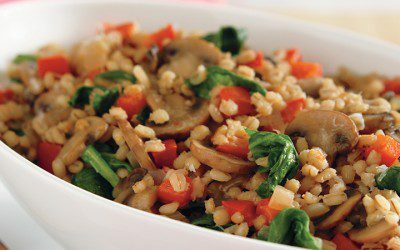 Add mushrooms; cook 5 minutes, stirring frequently, or until mushrooms begin to brown and liquid evaporates. Add barley; cook 1 minute. Add 1/4 cup hot broth; cook and stir about 2 minutes or until broth is almost all absorbed. Add broth, 1/4 cup at a time, stirring constantly until broth is almost absorbed before adding the next. After 20 minutes of cooking, stir in bell pepper. Continue adding broth, 1/4 cup at a time, until barley is tender (about 30 minutes total). Stir in spinach; cook and stir 1 minute or just until spinach is wilted. Stir in cheese and black pepper. Note: You may use your favorite mushrooms, such as button, crimini, or shiitake, or a combination of two or more.